According to Rich McCormack, Publisher of G.I. Jobs magazine, this honor ranks Mid-Atlantic Christian University in the top 15% of all colleges, universities and trade schools nationwide. At MACU we are proud to provide educational opportunities for military men and women. We humbly thank them for fighting for our freedoms. The Military Friendly Schools list is determined through exhaustive research by the G.I. 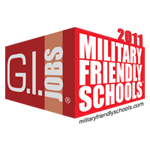 Jobs Military Friendly Schools® team. This research includes government agencies and private entities which administer education benefits and a comprehensive survey administered by G.I. Jobs. Criteria for the award include certifications, programs and policies, VA approval to accept the GI Bill, academic accreditations, ROTC programs, academic credit for CLEP and ACE, flexible learning programs and much more.